Reviewing current studies and previously unpublished research from leading laboratories around the world, Unraveling Lipid Metabolism with Microarrays demonstrates the use of microarrays and transcriptomic approaches to clarify the biological function of lipids. 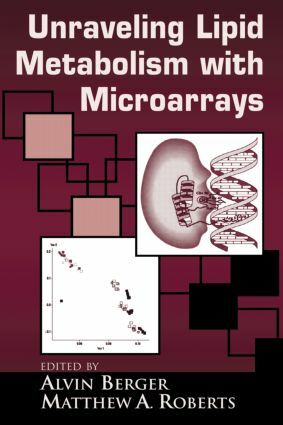 With contributions from world-class researchers, the book focuses on the use of microarrays to study and understand lipid metabolism. With coverage that spans the technologies of genomics, transriptomics, and meatabolomics, the text contains reviews of published work, provides a fresh look at new data, and presents previously unpublished work. It explores the role of fatty acids in gene expression and the various effects lipids have on the cell cycle, cholesterol metabolism, and insulin secretion. Taking a proteomic approach to looking at lipids, the book covers a wide variety of subjects, all linked to the study of lipid metabolism. "There are many tables, cartoons and references up to 2003. Who is not interested in the role of lipids, in obesity, diabetes, cardiovascular degree, etc and modern basic research?"